George Francis Gilbert Clutterbuck was an exceptionally strong wing three-quarter who ran in a lot of tries for Gloucester, but was also renowned for his sound defence. He broke the Club records for the most tries scored in a single match and the most tries scored in a season. George was born in Gloucester in 1876, the son of Enoch Clutterbuck, a builder. In 1881, when he was age 5, the family were living at 12, Wellington Street, Gloucester, but by 1891 they had moved round the corner to 8, Cromwell Street. George would have heard a lot about the City Club at home, because his father won a number of contracts for work on the new ground at Kingsholm. In particular, in 1892, he built the first pavilion on the ground – it might well be that his 16 year old son helped him with that work. George’s rugby career with Gloucester started in 1896, and he had a baptism of fire, playing his first game on 8th February away at Swansea, where Gloucester suffered a 0-30 defeat. George made 4 further appearances before the end of that season, under the captaincy of C Williams. 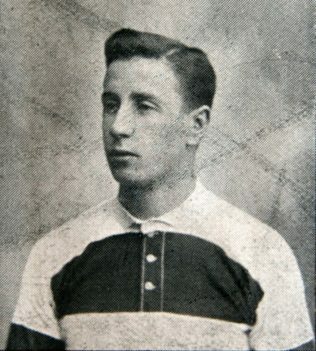 The following season, 1896-97, George established himself as a regular in the Gloucester first team, appearing in 23 of the 31 matches played that season under the captaincy of Walter Taylor. George put down an early marker in the first match of the season on 26th September 1896, scoring his first try for the Club in a 12-0 win against Cheltenham. On 17th October, he scored all of Gloucester’s points in an 8-3 win against Bristol, with 2 tries, one of which he converted. Further tries against Clifton, Llanelly, Cheltenham, Devonport Albion, Broughton and the North Gloucester Combination, saw him end the season as the top try scorer for the Club with 9. George started the 1900-01 season with the game of his life. He scored 6 of the 16 tries scored in the 66-0 win over Clifton, which set new records for individual and team scoring records. This was followed by a 0-0 draw at Penarth, before wins against Old Edwardians (44-3 with 2 tries to George), Stroud (33-0, with 3 tries to George) and Coventry (35-0, with another try for George). In those first 5 matches of the season, George had run in 12 tries, but then ran into a barren patch until the end of the year against Treorchy. He started 1901 with 2 tries against Bath, immediately followed by a further 3 out of the 14 tries scored in the 64-3 win in the return match at Clifton, who must have been heartily sick of the sight of George crossing their line 9 times whilst they shipped 130 points in the 2 games. Further tries against Llanelly, Cardiff, Penarth, and Cheltenham (2) brought George’s total for the season to 23. George played in 25 of Gloucester’s 34 matches, which resulted in 24 wins, 5 draws and 5 losses, points for 522, against 75, in the course of which Gloucester went through the season unbeaten at Kingsholm. George showed equally fine form in 1900-01 for the County team. He scored a hattrick of tries in their first fixture, a friendly against Midland Counties at Moseley. He followed this up with a try against Cornwall and two against Somerset, both matches won, but then played in the defeat at the hands of Devon, which put Gloucestershire out of the CountyChampionship. He won a further cap in a friendly against Glamorgan. In the first match of the 1901-02 season, “Whacker “ Smith ran in 8 tries against Clifton, thereby breaking George’s record of 6 in a match, achieved only a season previously against the same opponents. George struck in the second match with 3 tries in a 44-3 victory over Old Edwardians, but was laid low by injury on 26th October in a very rough match against Pontypridd, which Gloucester nevertheless won 14-8. George played in the first two Gloucestershire matches of the season, which were won against MidlandCounties and Cornwall, but thereafter lost his place in the side which reached the County final before losing to Durham at Kingsholm. Although George came back later in the season for Gloucester, and scored a try in the return fixture with Old Edwardians on 18th January 1902, that proved to be his penultimate game. He put in a final appearance against Swansea (also the opponents in his first game for the Club), on 12th April 1902 at Kingsholm, a defeat by 0-9, described as “the most unpleasant game this season, stoppages for injuries being very frequent” – maybe George was ready to retire after that. George’s career record with Gloucester was 131 appearances in 7 seasons, scoring 205 points from 58 tries, 4 conversions, 5 drop goals and 1 penalty. Ten years after the end of his playing career, George was employed as a crane driver. He was elected to the Club Committee on which he served until 1935. George died, aged 70, in Stroud in 1946.